I frequently get questions related to investing that I like to write down for posterity. I take great pride in educating the investor masses in India and feel good about helping them make money. These are some of the latest. Q1: Your investment prowess is incredible. I mean it's like you have a crystal ball. I've been reading your journal religiously, and I was wondering: In Return of the Jedi, there's this giant worm or slug thing that enslaved and chained Princess Lea to it . Was that you? Q2: Who makes more money an India Investment Banker or an Indian Politician? A2: Early in my career I used to be amazed by the size of houses of politicians. I used to wonder how on a meager salary these politicians could build such grand houses. One day I asked him how he had the money to afford the house and he responded "it's simple, I borrow from pessimist voters, they don't expect the money back." Q3: The BSE is talking about further reforms to the stock exchange. What are your thoughts on that? A3: The BSE board and their so-called reforms comprise of the Louvre of financial mistakes. These people don't believe in a free and open BSE unless there is an admittance charge. Q4: I'm a beautiful 21 year old girl. I'm funny, helpful and can hold a good conversation. I'm looking to find and marry a guy who makes at least a crore a year. Rakesh, I know how that sounds, but keep in mind that a half a crore a year is middle class in Mumbai, so I don't think I'm asking for too much. A4: Your offer, from the perspective of my sidekick Mini-j, is not an attractive business deal. Here's why. In simple terms, what you suggest is a trade: you bring your looks to the deal and Mini-j brings his money. Sounds good so far, but there's an interesting twist, your looks will fade and Mini-j's money will likely continue into perpetuity... in fact, it is somewhat likely that Mini-j's income will increase (assuming the Hungama Mobile deal works) but it is an absolute certainty that you won't get better looking! So, in economic terms you are a depreciating asset and Mini-j is an appreciating asset. Not only are you a depreciating asset, your depreciation accelerates! Let me explain, you're 21 now and will likely stay attractive for another 8 years, but less so each year. Then the fade accelerates as you reach 30 and by 35 no one is turning their head to look at you anymore and Mini-j has to reenter negotiations with another girl. Q5: In early January my broker was telling me to buy stocks as the market was going to go up. I found out last week that he had sold all of his stocks in mid-January but didn't tell me. A5: Well obviously if your broker thought the market was going to crash and wanted to quickly get rid of his stocks, he needed to convince someone like you to buy them. 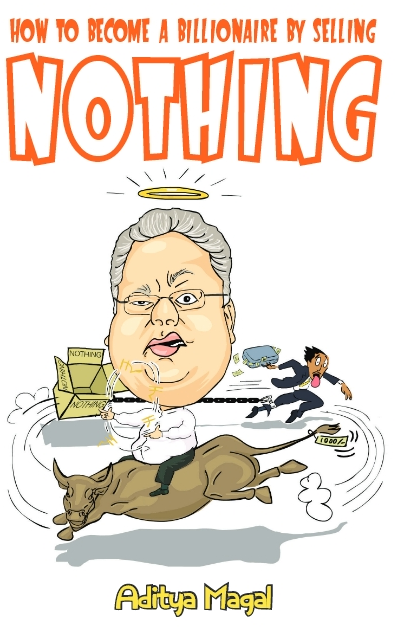 Q6: Mr. Jhunjhunwala, can you tell me how the stock market works? A6: I like to keep things simple for my simple-minded audience so I developed this quick story to explain India's stock market. In a local village, a man appeared and announced to the villagers that he would buy cobras for Rs. 400 each. The villagers knew there were many cobras around the village and started catching them. The man bought thousands at Rs. 400 and as the cobra supply started to diminish, the villagers stopped their effort due to the increased cost of finding them. The man then announced that he would now buy at Rs. 800. This emboldened the villagers to start catching cobras again. Soon the supply diminished even further and people started going back to their old jobs. The man now announced that he would buy cobras at Rs. 2000! However, since he had to go to the big city on business, his assistant would now buy on behalf of him. Now that the man was out of sight, the assistant told the villagers. "Look at all these cobras in the big cage that the man has collected from you. I will sell them to you at Rs. 1500 and when the man returns from the city, you can sell them to him for Rs. 2000 each." The villagers rounded up with all their savings and bought all the cobras. Then they never saw the man or his assistant again, only snakes everywhere! Now you have a better understanding of how the stock market works. US Credit Crunch effecting India?